Afra Bianchin was born in Montebelluna in 1937 and Tobia Scarpa in Venice in 1935. Both were influenced by Tobia's father Carlo Scarpa, particularly his interest in the technical properties and aesthetic possibilities of materials. 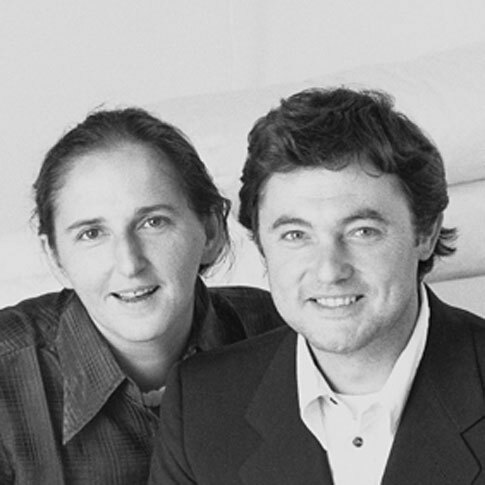 After graduating in architecture in 1958 they began working together with Venini in Murano. In 1960 they collaborated with Cassina where they designed furniture exclusively for the home including the Soriana armchair which won the Compasso d'Oro award in 1970, and the 925 armchair which is part of the permanent collection at MoMA in New York. In 1960 they joined Flos and worked as designers with the Castiglioni's. Their best known pieces for B&B Italia are the Coronado sofa and armchair collection.